I know when people or companies try to tell me that a product will work for any skin type, it’s nearly impossible to believe. Now as the packaging designer of Citrus Honey Aqua Glow itself, you may think of course she loves this product– but try to hear me (and the other rave reviewers) out. I am not skincare aficionado. I have however, learned a thing or two from working at Peach & Lily, trying products, reading ingredients lists, and just being around Alicia while she tests and researches numerous formulas. One thing I can definitely attest to is being in-tune with my skin to the point of paranoia –I notice every bump, new mole, or rash; Maybe it’s my attention to detail, the woes of a designer. But this thing works and you can see it every application. During product development I wasn’t the first to test it. So, when the rave reviews came in from members of our team with truly all skin types (sensitive skin, acne, oily skin you name it), I couldn’t wait to test it out and start the packaging. I was a bit skeptical at first, as how could it possibly help with all of the team’s skin issues? But after my first try of Aqua Glow, I was hooked; but not in a “I’m craving chocolate today, so I need my short-lived fix” sort of way, but more like “My skin is parched, sometimes oily, and I’m going to put on make-up. What can I reach for that will fix my face right now?” and I started to reach for this cream every single day. Citrus Honey Aqua Glow (affectionately “Aqua Glow” for short in our office), is a super balanced serum-moisturizer-in-one. 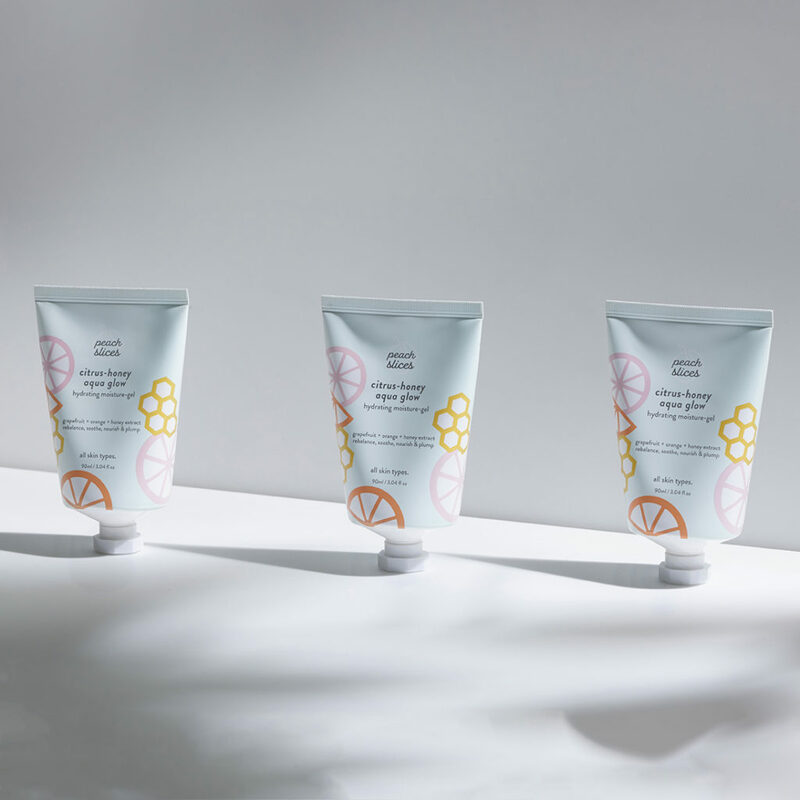 The citrus extracts, which also attribute to the fresh and gentle scent, are brightening while honey, ceramides, and other hydrating ingredients add that plump, supple feeling everyone craves. This petite bottle can give that glowy, dewy, but not-greasy look to just about anyone, whether you have normal, ultra oily or dry skin–or some combination of the them all. For me, the perfect gel moisturizer has to balance where it’s super hydrating (like most), yet still nourishing and not instantly dissipating from skin (hard to find) and this cream hits that sweet spot. It’s not greasy at all, and has this instant absorbability that leaves the perfect smooth base that makes foundation or other base makeup set on your face with a natural “this is my real skin” type of finish. One of the best parts (for me and for you)? This product is a true steal. I have never been so satisfied with any priced everyday moisturizer and I have tried a lot working at Peach & Lily. I currently have two sad, aqua glow tubes on my dresser at their last drops that I keep squeezing “last” applications out of (you really don’t need much) and I plan on getting a fresh tube. At $12, maybe I should get five.